Have you been thinking about publishing a 360 Video to advertise your Country Club or Golf Course? Excellent idea! EolianVR is one of the only firms focused on 360 Video Production Services for Golf Courses, and we want to help. Many country clubs and golf courses already using 360 Videos to increase brand awareness and grow sales. By publishing a quality 360 Video you can grow sales by enticing new customers and driving loyalty from current ones. Although, producing a quality virtual reality video is an extremely difficult task, especially 360 videos featuring wide, open outdoor landscapes and quick action like golf swings. 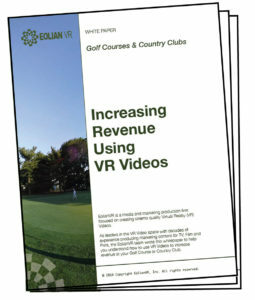 EolianVR has extensive experience planning and producing 360 videos featuring country clubs and golf courses. It is an area of production that we enjoy because many of our team members are avid golfers. We bring the expertise, tenacity and relentless pursuit of perfection you need. We are fully equipped to produce 360 videos, on any magnitude–ranging from short one day shoots to very-complex multi-week shoots in isolated locations, without power, anywhere in the globe. If you want to find out more about how 360 Video can help you grow revenue, call us today! You can also read our whitepaper, Increasing Revenue Using 360 Video. Want to watch a 360 Video we produced featuring a Golf Course? You can, below. With your Computer: You are able to watch the 360 Video shown below on your computer by pressing play and then using your mouse, drag the 360 video to whereever you want to look. Definately increase the 360 Video’s resolution by pressing the icon shaped like a gearbox located in the right, bottom corner of the video, after you have started playing the video, and selecting 4k. With your Mobile Device: You can watch the 360 Video below on your mobile device, by clicking the large link above the 360 video to watch the content properly. With your VR Headset: For the absolute best viewing experience, we recommend experiencing our videos on a Virtual Reality Headset (such as the Gear, by Samsung or Vive, by HTC), and using an app which is able to stream at a higher quality than YouTube (such as the VRVideo app or the SamsungVR app). Or, even better, let us come to your business and demonstrate the Virtual Reality expereince. We’d also love to sit down and discuss your goals. Call us today if you are interested: 201.294.9557. In addition to 360 Video Production Services for Golf Courses, EolianVR also offers 360 Video Production Services to other industries. Below is a list of links to our pages detailing our services for each industry. Feel free to browse.